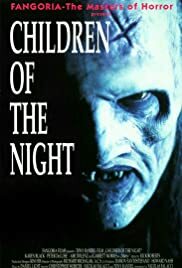 A schoolteacher teams up with with a priest to stop a town being overrun by vampires. A claustrophobic thriller about two murderous friends, used by a desperate woman who they dangerously underestimate. A horde of rattlesnakes inexplicably descends into "Eden Valley," terrorizing an isolated family and forcing them to fight for their lives. Karen Thompson: Feeling regretful, Frank? Well, I guess that's pretty standard in your line of work. I'll never apologize for the way I am. I like it. If I want someone's blood I'll take it. And I'm not ashamed of what I am and what I want and how I want it, and I want you. My soul, my flesh craves you. Unique take on the vampire genre! This movie is a typical B movie..but what they do with the "normal" legend of vampires. For one the vampire use water as their coffin instead of an actual one, once under water they spit out their lungs and breaths the water. In one scene this women vamp made her own cocoon to sleep in the special effects are really good in this scene. Its a cheap movie but its fun....its a saturday night kind of flick! !